Big haul last week so I’ll keep it as brief as possible. 14 titles. Damn. Edit: I’m really bad at maintaining my blog with reviews and such, so I think I’ll stop trying to aim for such ambitious things like recapping a week. Still suffering the effects of whatever illness I had, I laid in bed and flipped on my TV to see that Remember the Titans was playing. I’ve always liked it – it’s uplifting in a sentimental way that never becomes objectionable and only becomes maudlin once when the film takes on a secondary tragedy when one of its main characters gets injured in a car accident; achieving a small sense of sincerity which is surprisingly rare for most sport-oriented biopics. The performances are quite good across the board. When I looked up the film on IMDb, I was stunned to see Hayden Panettiere was the girl playing the gridiron crazy daughter of the assistant coach. Also, when you go into the film remembering Ryan Gosling has a small role, you find yourself admiring how casual his talents are even in this stepping stone feature. Ethan Suplee is a delight – his cavalier attitude about everything resulting in bringing the members of both races into harmony always makes me smile. Wood Harris and Donald Faison bring great charisma to the team trying to prove racial integration can isn’t as stupid as an idea as southerns believe and Denzel Washington adds a layer of questionable morals to the driving force of the team. It has a lot going for it in terms of its charisma and the charm it brings to the table, but of course it falls into the plot trappings practically every 21st century sport film has — predictable plotting, obvious tension, and turns that are never quite edgy enough to place its viewer in a vulnerable position. Always a fine, enjoyable watch, but there’s not much going for it beyond that. In Korine’s attempt to defy the conventional film, he’s made many cult classics with Gummo showcasing his melange of subversion most coherently. Julien Donkey-Boy, Kids, Trash Humpers – these, too, are films that battle against political correctness with flagrant bawdiness and anarchist overtones. Harmony Korine always attempts to deconstruct what we view as traditional by presenting us an alternative, if extravagantly raunchy, spin on the world we inhabit, and if there’s a criticism against him it’s one he welcomes: the man is incoherent. He jabs at his films with youthful madness (nearing 40 the man is clearly never going to grow up in the conventional sense) and distorts the picture to his own satisfaction. His is an onanist and makes films only to please himself and those who share his incendiary thoughts. With Mister Lonely, though, Korine exchanges his grim and gritty compositions for awe-inducing cinematography; his consequentially blinkered ideologies for profundity (while simultaneously mocking the hipster sub-culture which beholds him as a God); his general meanness for a similar bite without the overwhelming discord, altering the attitude to be regarded as stark rather than adolescent outcries. Though this feature fell between the cracks upon initial release — critics weren’t on-board with his more tame spin on his dissidence and felt it had too little narrative while his major supporters balked at the ten million dollar budget, casting of bigger names and felt it had too much narrative — this feature has always held a special place in my heart. That simple, sad feeling of insignificance is told so beautifully through these lonely people who feel worthless because they know not who they are, but view and idolize great figures so that any chance of them believing they can achieve greatness is lost. Here, the protagonist is a Michael Jackson impersonator who follows a Marilyn Monroe impersonator to an island of misfits. There are no cheap shots at MJ’s alleged pedophilia, nor is Monroe detailed with drug addled problems (though her character does find tragedy in love like the icon). These are real people who are sincerely lost; they possess only the essence of those they wish to be, so they charm while they depress. In anticipation for his new release (which just won Un Certain Regard at Cannes) I watched my first Kim Ki-Duk film, 3-Iron. It’s a simple film wherein its protagonist never speaks; where actions speaks far louder than any words can; where romantic idealism runs its course. Hyun-kyoon Lee plays the decided mute Tae-suk who has no home to call his own and who has devised a clever little plan to get around homelessness. He breaks into the homes of others, eats only enough to fill himself and fixes things up as a way of repayment. The self-effacing man’s daily routine is shaken up when he breaks into a home only to find an abused housewife still at home. With sincere gestures, Tae-suk wins the woman’s heart, and when he realizes the cruelty of her husband, he grabs her and continues his routine as if she were not present. That’s basically all the ninety minutes of the film encompasses, but hardly what it details. There’s a metaphysical semi-thought that is floated in the final act that presents some great humor for most and deep insight to those willing to probe it further (personally, it disengaged me on an intellectual level because there wasn’t enough there for me to chew on). What I got from that segment was just a sense of astonishment at how it was all handled; Ki-Duk keeps the mystery of what’s going on at a max and while he does change the film’s sensibilities with the metaphysical final act, while feeling out of place in this such film, it does subsequently make it unpredictable and far more captivating as a result. As for the first two acts? Utterly beautiful, if occasionally relying too heavily on coincidence to make its points. A great film through and through and one of the finer films I’ve watched this year. The Conversation is the kind of the film, to me, depends completely on the final twenty minutes of its story for it to have its worth. It’s protagonist is played by Gene Hackman in the most straight-laced way because he’s a straight-laced kind of guy. There’s a dream sequence wherein we learn of the character’s terrible religious uproots, but then it also explains for the audience to a point of annoyance why he is so worried about being involved in the situation he’s in. It dissects and then overanalyzes and can become an exhausting watch because there is so little to learn about the man, but Coppola spends an hour and a half developing his character, when we have all the information we need on the guy when we learn he was involved in another conversation-tapping tragedy. However, the banal atmosphere and build-up perfectly juxtaposes to the murder scene toward the end; a scene which I consider Coppola’s most well-handled and one of the only true moments of terror I’ve experienced while watching a film. By the end, I realized my problems with the film were entirely dependent on how much I enjoyed watching it as opposed to how well it was pieced together and how technical the structure was, so in reflection, I appreciate it far more than I did while first experiencing it. I will say this though – the final scene does not at all scratch the surface of the protagonist’s grief about what had transpired, but rather superficially shows him in panic for his own life and security. It’s cute, a bit ironic and the final shot shows his apartment (ie. life) in shambles, but it is not at all a satisfying close — nor even apt for what the film was about — for this emotion-based journey. 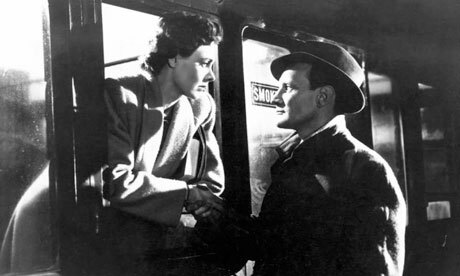 Bold in its day for not treating its adulterous protagonist with contempt, Brief Encounter was the boldest talkie to frankly and unbiasedly discuss infidelity. The story is about a woman (Laura, played by Celia Johnson) who finds herself hopelessly charmed by a doctor (Alec, played by Trevor Howard) who is both unassuming and passionate about life. After a second chance encounter with the doctor, Laura begins to question what she wants out of life; the contrast between her home life populated by her two typical and privileged children and a jejune husband and her engagements with the doctor guide her to the conclusion that her time/life is better spent in Alec’s company. Of course then the film becomes about the inner rumblings of Laura, but this is spoiled by an abundance of poorly used narration which personally kept me at a mile’s distance from the emotionality of the woman’s dilemma. Firstly, she has no personality of which to speak, so I can only judge her based on her actions which consist of neglecting her children and betraying her husband. Secondly, her narration is so banal that I can’t find any kind of way to be interested in the woman on an intellectual level. In addition to this, I found the doctor quite boring himself. Oh, he gets his pants wet by accident and laughs about it, how fun. Really, the time she spends with the fair doctor is all fine and dandy, but I felt nothing there between them – nor was it articulated maturely enough – to have a vest interested in their time together. Hell, the two share the same wry inappropriateness about certain things and speak with similar loquacity, so it’s hard to buy the film as a brief throe of passion because there isn’t enough difference there to be minimally exciting. Well their personalities might differ, but despite the abundance of narration I found nothing particularly unique about either character. This works against Johnson’s performance which entirely consists of ethereal looks of deep sadness or uneasy happiness; expressions aimed to provoke sympathy and only sympathy. And to me, the worst kind of performances come from performers who aim only to achieve one response from their viewer. Now this isn’t one of the worst performances I’ve seen, but it’s clear Johnson’s only objective was to earn awws and while she does that decently, it’s still one of the more boring performances I’ve seen in awhile. Thoroughly boring and disengaging on every important level – feels twice its length and is only recommendable for those interested in really high quality black and white cinematography. That’s all I’ll do for this week. I’ll eventually get around to writing reviews for Festen and The Idiots because I really liked those films. I don’t know when I will, but hopefully soon. Perhaps I’ll do a Dogme post. This entry was posted in Films I Saw Last Week.